Surbiton’s newest Indian restaurant is worlds away from the traditional Anglo-Indian curry house. Ornate semi-authentic decorations and tawdry red velvet furnishings have been rejected in favour of a brightly-lit, modern interior featuring bare brick walls and hardwood floors. 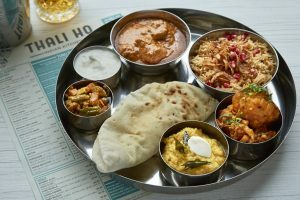 From its eye-catching turquoise exterior to its pared-down menu, Thali Ho is leading a revolution in Indian dining. 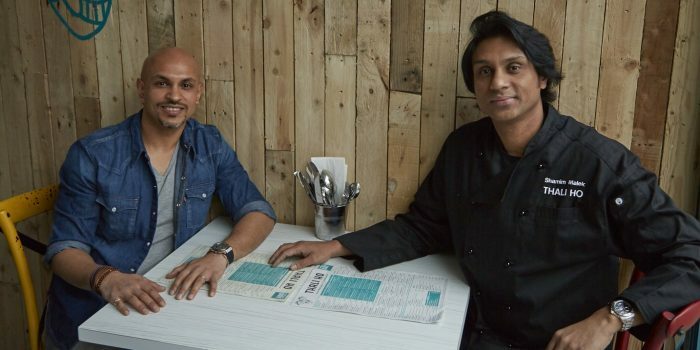 Brothers Shamim and Shah Malek opened the restaurant and takeaway on Brighton Road in October last year, and just three weeks later it was crowned the best casual dining restaurant in the London suburbs at the Asian Curry Awards on November 12. The innovative duo claim their success is proof that Brits are hungry for more authentic Indian cooking. Shah, a 35-year-old father of three, says “the Western palette has evolved dramatically” and restaurants need to adapt. “There are readily available spices wherever you look and people are actively using them in their home cooking, so gone are the days of making something very mild to suit the English palette,” he said. In recent years, less forward-thinking Indian restaurants have been closing at an alarming rate, and now the £4bn industry is facing a crisis. Last February, the Asian Catering Federation made the gloomy prediction that 50 per cent of Britain’s 17,000 curry houses could close within the next 10 years. Chairman Yawar Khan said many restaurateurs – the vast majority of whom are Bangladeshi – were not paying heed to changing customer demands. 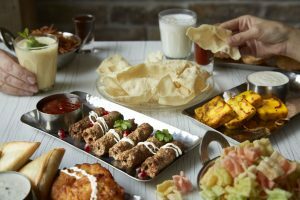 Their focus on authentic cuisine is undoubtedly what has brought Shamim and Shah, who grew up in Surbiton and own several other restaurants around London, an early wave of success in their latest endeavour. 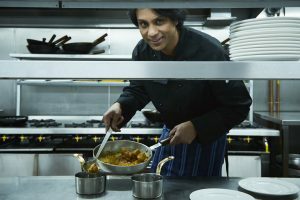 Head chef Shamim, 42, developed the menu using recipes passed down from his parents, who moved to Britain from Bangladesh in the 1970s and opened several successful curry houses. “It’s home cooking,” he said. True to name, the restaurant focuses on thali-style dining, where customers receive a platter of several items served on small dishes called katoris. Shamim explained that this is how Indian families eat at home, but the concept is rarely seen in the curry house. The passionate chef, also a father of three, added that simplicity is key – other Indian restaurants often have 200 items on the menu and put themselves under immense pressure. While affable Shamim is the menu mastermind, assertive businessman Shah oversees the front-of-house. The former BMW manager prides himself on hiring locally and personally training all his waiting staff, which has helped the brothers overcome another common problem amongst traditional curry houses – an over-reliance on staff from the Indian sub-continent. With their combined expertise and intense attention to detail, the Maleks have built what they believe to be the whole package at Thali Ho. Lively music, a modern setting and friendly service – including Shamim’s regular visits to the restaurant floor for feedback from customers – combine to create a fun, laid-back atmosphere. Though confident in their business model, the brothers are anything but arrogant. In fact, when they received a phone call inviting them to the Asian Curry Awards, they thought it was a prank or a competitor attempting to humiliate them. But within days they found themselves on stage at the Grosvenor House Hotel receiving the coveted accolade. During the awards ceremony Khan again spoke of the challenges the curry house industry – which employs more than 100,000 people – is facing. But he highlighted the success of restaurant owners like the Maleks who are willing to evolve. Afterwards, a judge told the brothers that the mystery diners who decide the nominations had found Thali Ho so unique that the judges saw them as the clear winners. The siblings claim they were always destined to open a restaurant as they spent their childhoods helping in their parents’ curry houses. 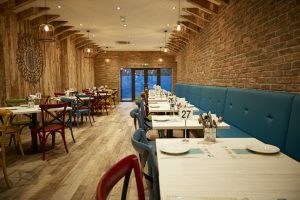 They opened their first restaurant, Rivaaz, in New Milton in 2005 and enjoyed quick success – within two years they’d opened a second site in Lymington. But having grown up in Surbiton it seems fitting that their greatest success may be achieved there.